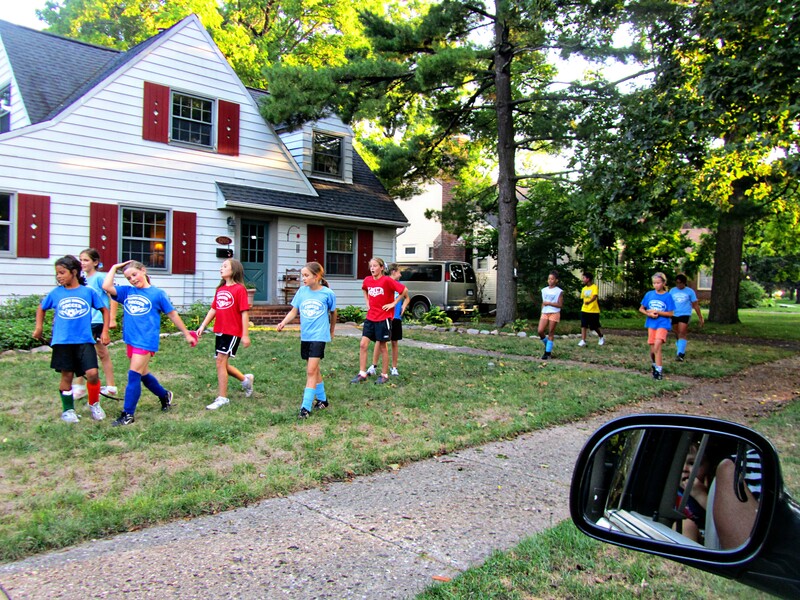 Soccer has begun, and this year the coach decided that we were always going “to beat the other team to the ball.” So the girls ran. And ran, and ran, and ran, and then ran some more. All their running paid off, and generally we won games because we beat the other team to the ball 90% of the time. 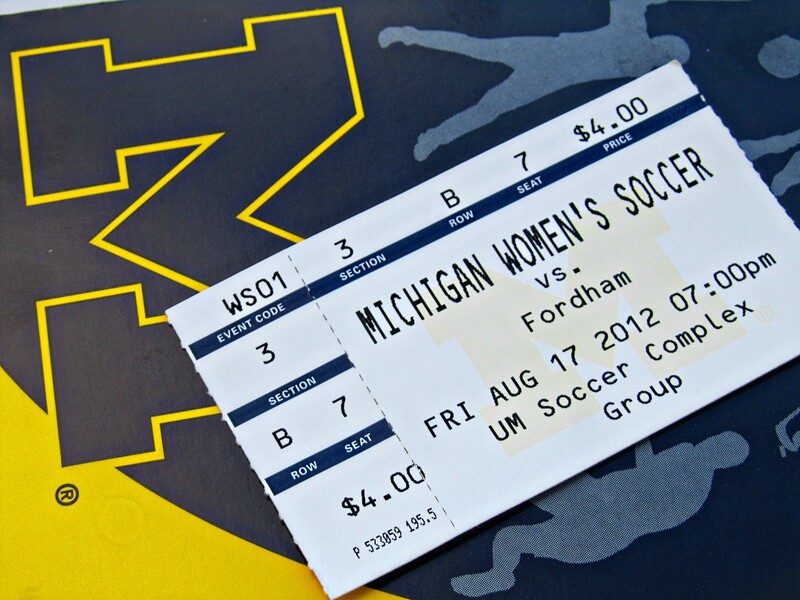 To start the season inspired to play, the coach organized an outing to a U of M Woman’s Soccer game. 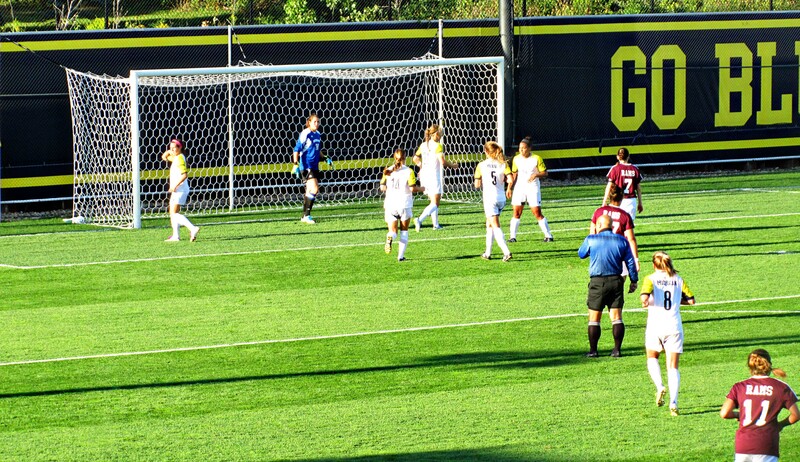 Michigan won after two overtimes, and the girls cheered until they were hoarse. Most of the soccer girls spent the night together, so that meant just Little Man and Eloise came home with me. Having less kids around, I had more free time, so I started my day by proofing yeast for pizza dough. Any morning that start with baking is going to be a good day, and today was no exception. I thought we would have STEAKHOUSE PIZZA (pg. 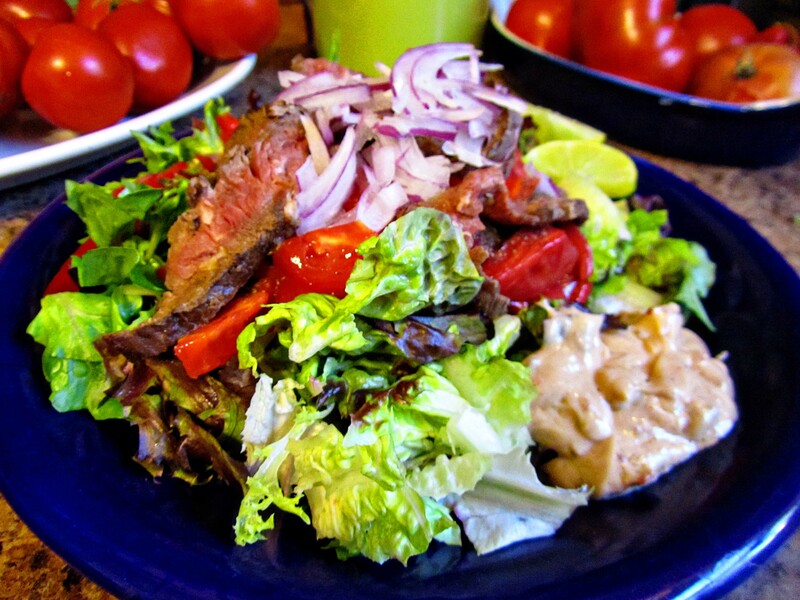 142) for lunch and then CHIPOTLE STEAK SALAD (pg. 48) for supper. 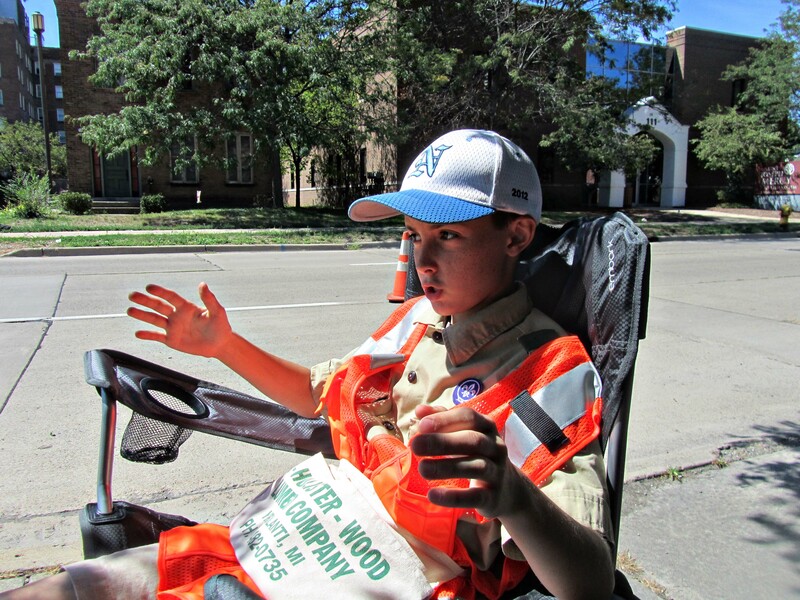 With pizza dough made and rising, I headed off to pick up my kiddos at our town’s Heritage Festival–a combination parade, flea market, fair, community games and competitions, fried food, and for our Boy Scout Troop–a fund raiser. 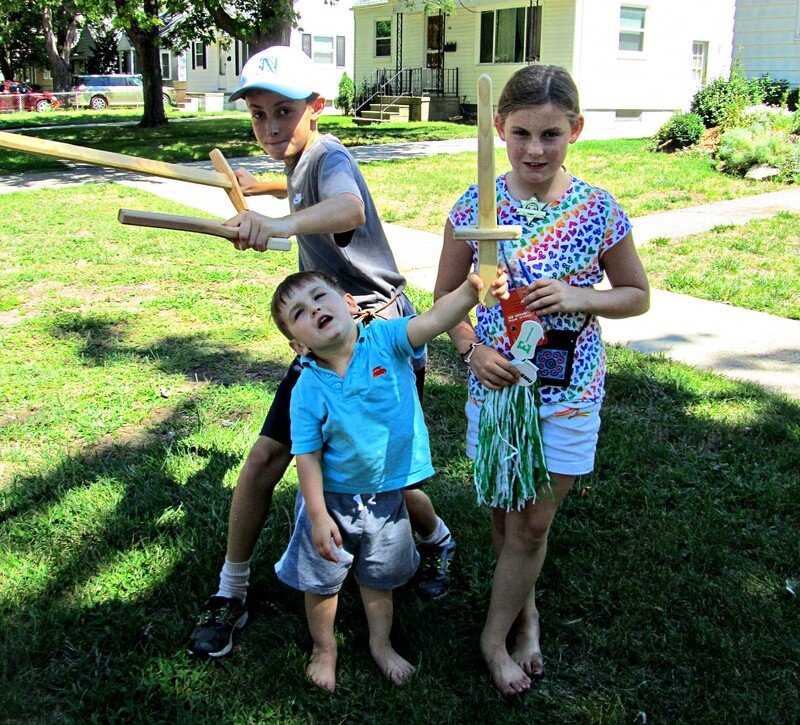 The kids all came home with fair goods–wooden swords and guns and handmade purses. All the walking had made everyone hungry, so I had to hurry up the pizza. Get the grill going then slice up some red onions. 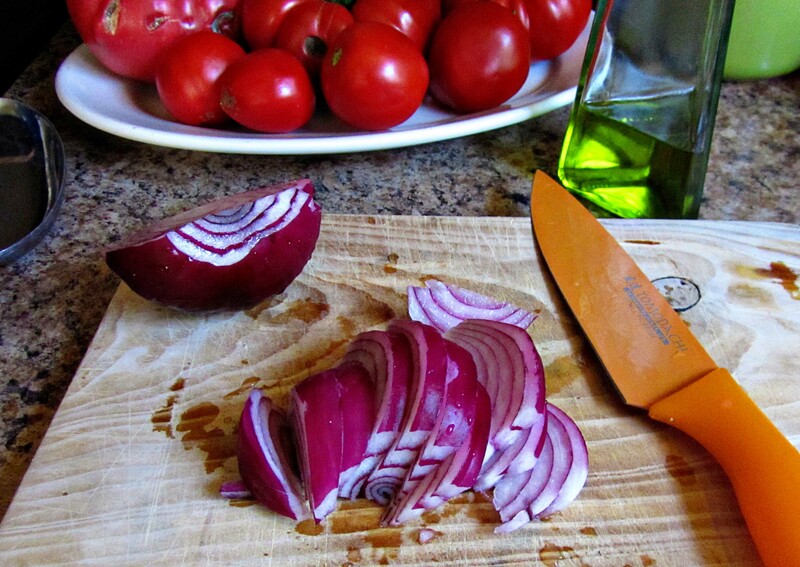 This link provides a great guide to the difference between yellow, white, and red onions. 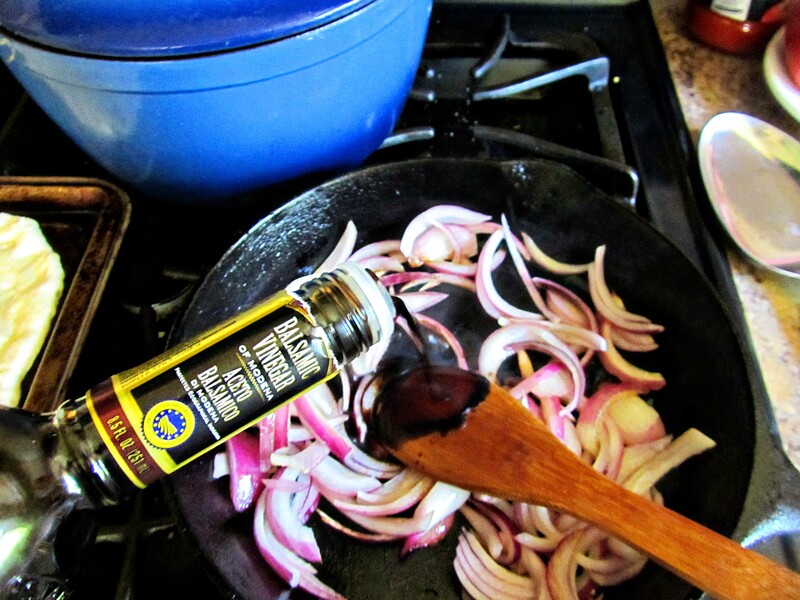 Saute the red onions in olive oil and a splash of balsamic vinegar. 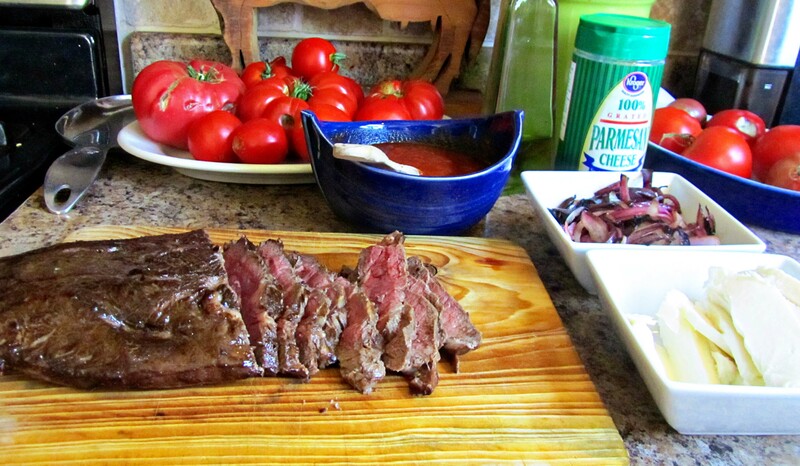 While the onions are cooking, add a seasoned flank steak to a hot grill. 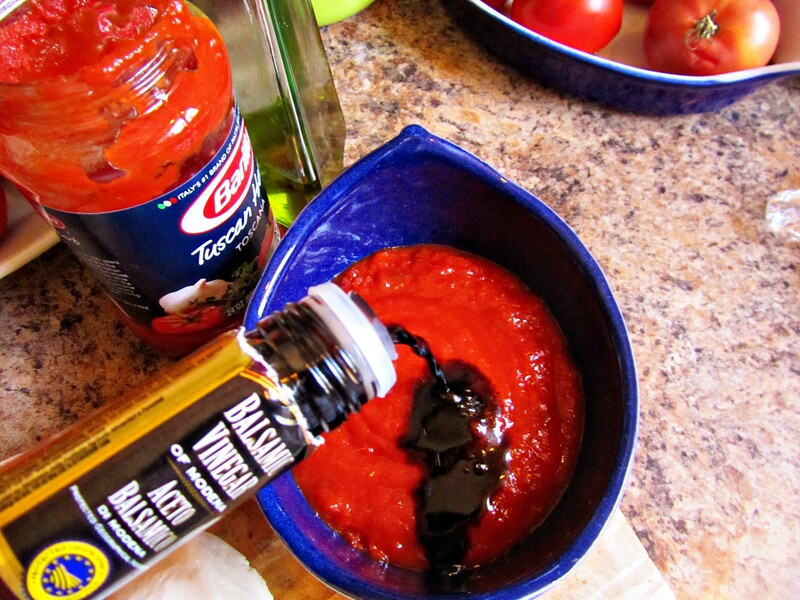 Using store bought marinara sauce, add about 2 tablespoons of balsamic vinegar. The flank steak really doesn’t take long to cook–especially as it will cook a little more in the 500 degree oven, so keep the steak on the rare side. 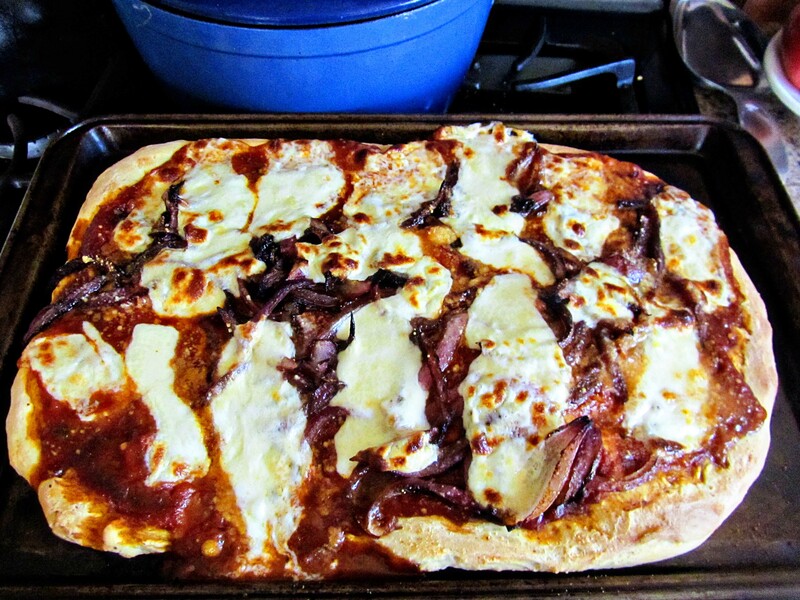 Assemble the pizza with marinara sauce, grilled flank steak, mozzarella, and some Parmesan cheese. PW adds some steak sauce on top, but I was out of steak sauce, and really didn’t think it needed it. Ree also partially pre-bakes her pizza crust. 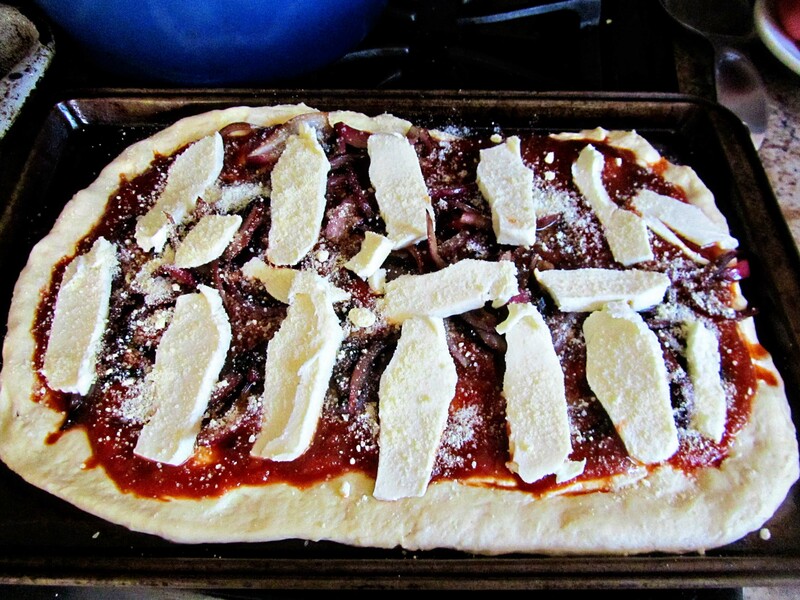 Bake at 500 degrees for about 15 – 20 minutes, or until the cheese is hot and bubbly. 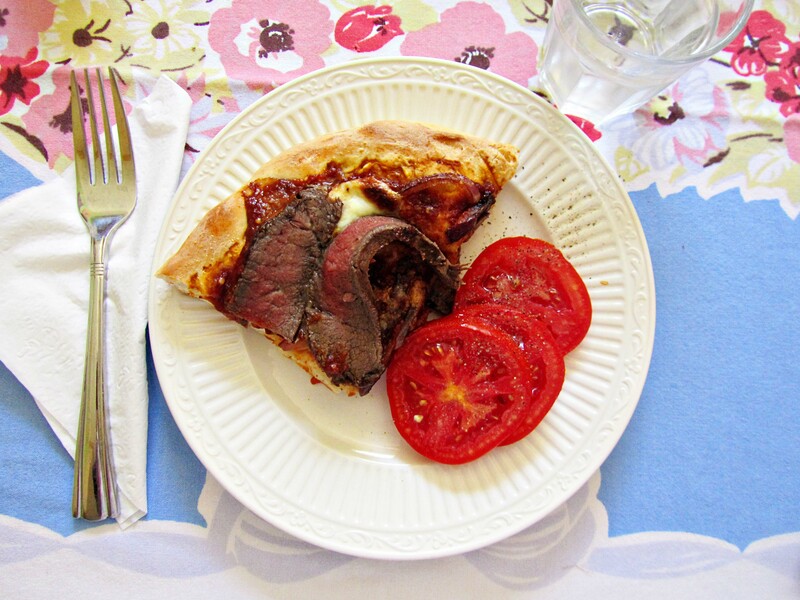 A hardy steak lunch–just right for an afternoon of parking cars for the Boy Scout troop. BTW, the table cloth was my flea market purchase. I had been dreading this car parking fund raiser. The Hunni was out of town, which meant that all the kiddos had to go park cars. Since we were going to be right next to a busy road, I had them stay in the car and watch movies. This meant that they were going to watch movies for about four hours. BUT, after I just accepted the fact, and prayed that Little Man wouldn’t climb in the front seat and put the car in gear or anything like that, I pulled out my chair and sat down. For the next 4 hours I visited with my boy. I haven’t spent time like that with him in ages!!! The afternoon is one I will treasure. I had two extra kiddos in bed with me the night before as they were scared to sleep downstairs by themselves. That, plus sitting in the hot sun, made me so sleepy that I dozed off. An elderly gentleman walked by and told me he wanted to get me a cup of coffee. 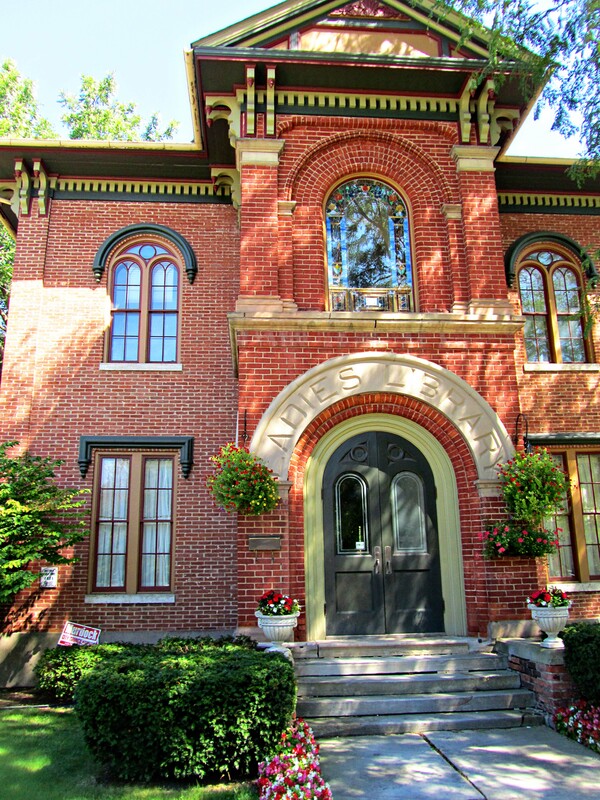 I followed him to the Ladies Library which has been converted into the Historical Society where he poured me a coffee and gave me some cans of Coke for the kiddos. How kind! We had a Boy Scout moment. Two females with matching tattoos locked their keys in their car. 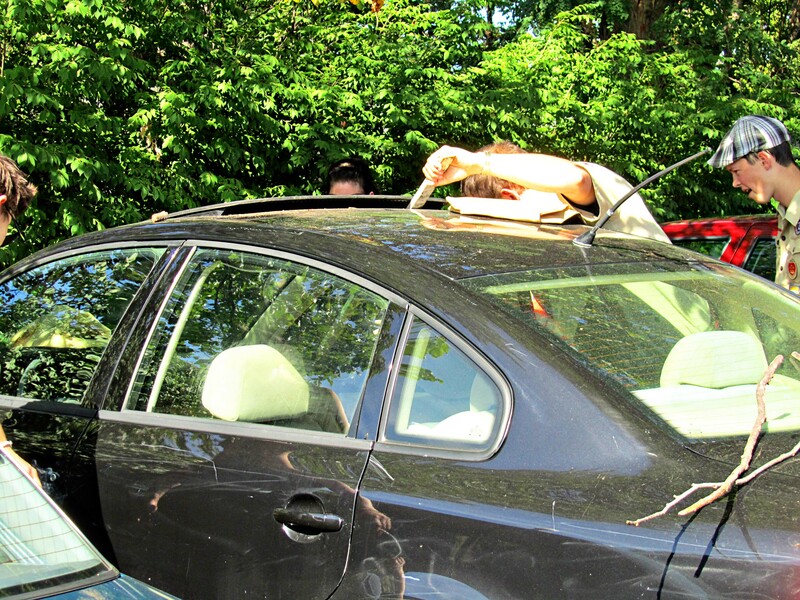 Thankfully, they had a sun roof. 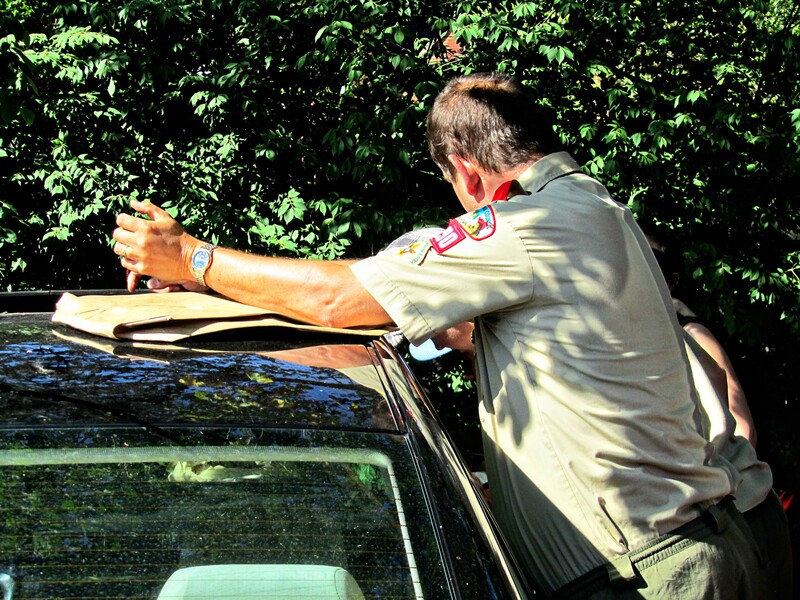 Our troop leader worked a stick through the sun roof and unlocked the passenger door. Both of the tough females were so thankful, that they gave him burly hugs. Boy Scouts bought everyone Taco Bell for supper, but the combo of Coke and coffee in the hot sun had left me needing something green and fresh. Once home, I started a Chipotle Steak Salad with the left over flank steak. I miss the greens of summer. 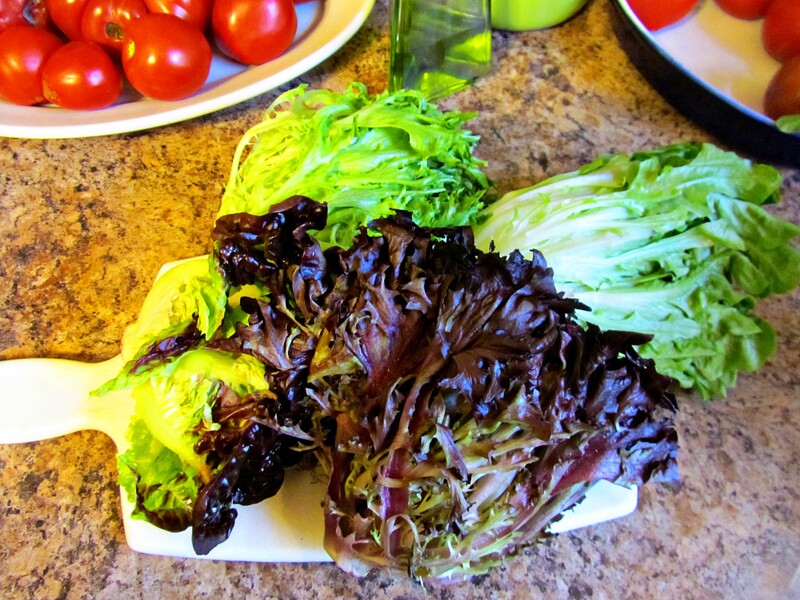 Winter lettuce is so anemic looking. And this bad boy is a Beefsteak from my back yard. 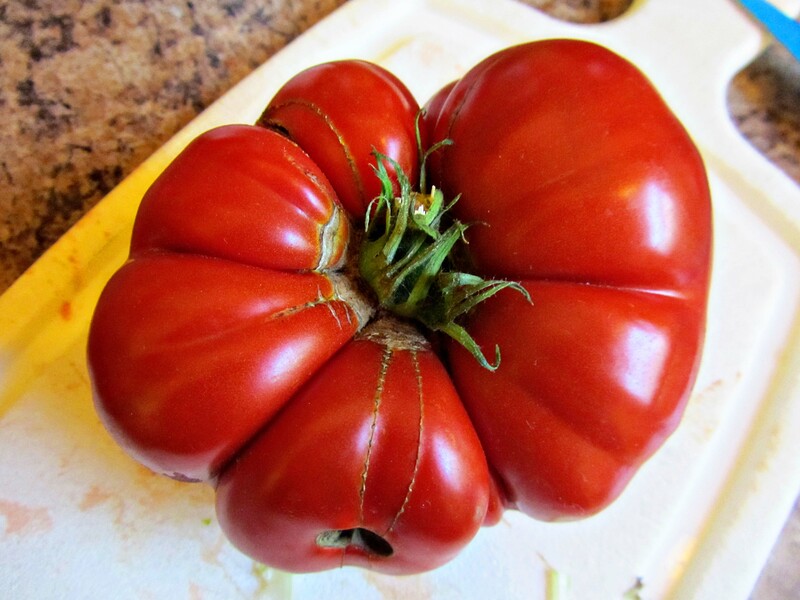 Beefsteak tomatoes are huge and bulbous and have a tough skin, but their flesh truly is “meaty”. These tomatoes always remind me of my childhood home (the farm) as we ate these every summer for almost every meal–with Prairie Farms cottage cheese and a dab of Miracle Whip on top. Crack open a can of chipotle peppers in adobo sauce (found in the Mexican section of your grocery store), and chop up one chipotle pepper. 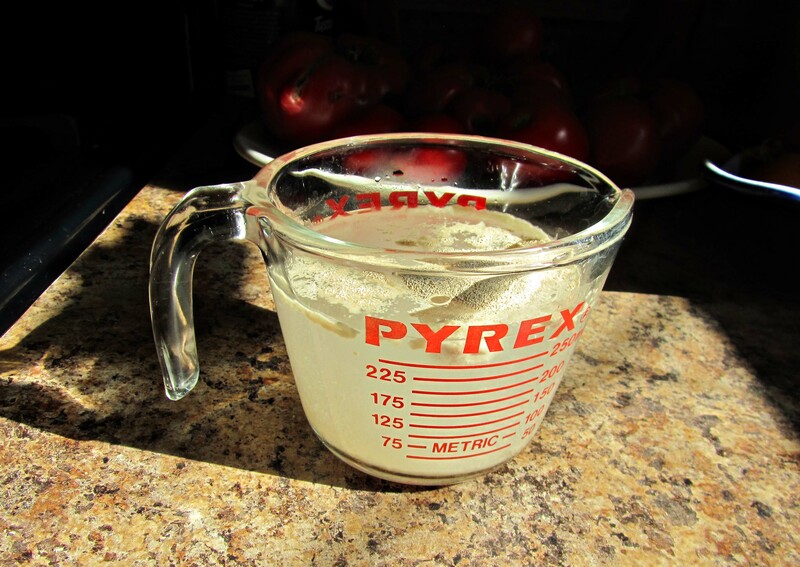 Add in some olive oil if you like your salad dressing a little thinner. 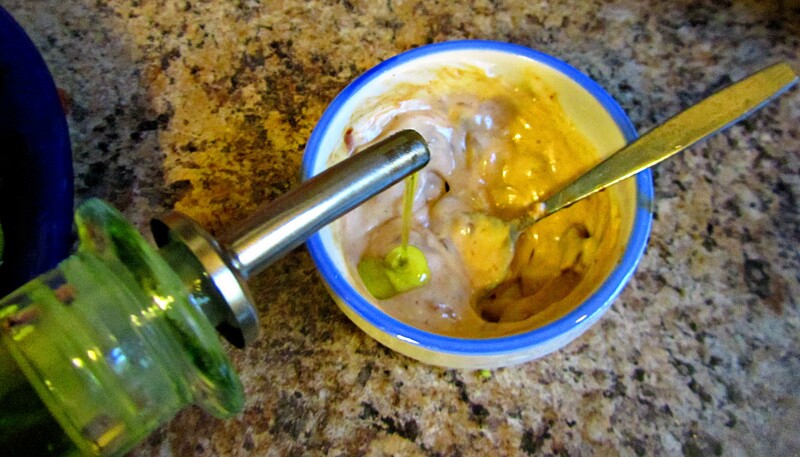 The chipotle peppers have quite a kick, so add more mayo or some Ranch dressing if you find it too hot. 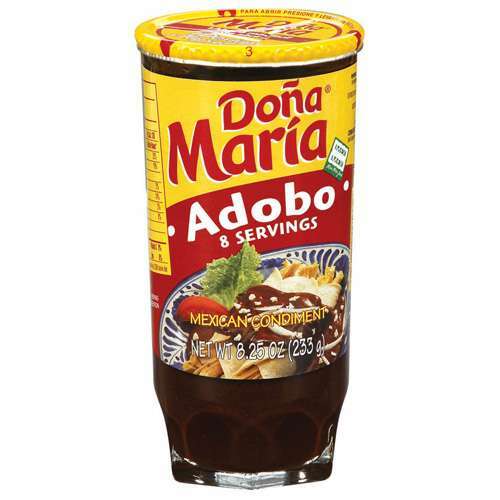 Adobo Sauce: Think of adobo sauce as the Mexican’s BBQ sauce or ketchup. It is basically a sauce made of chipotle peppers, vinegar, garlic, ketchup/tomatoes, onions, salt and water. And just like BBQ sauce everyone has their secret combination, their secret herb mixture, and their special adobo sauce. 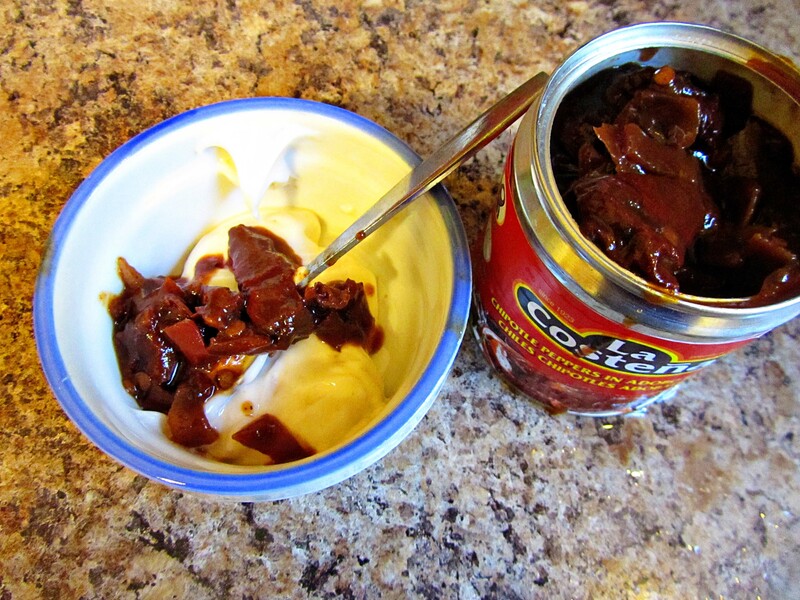 And like BBQ sauce, adobo sauce can be used as both a marinate or a sauce or even a condiment. Chipotle peppers packed in adobo sauce keep for a long time in the frig–like ketchup. Here is a recipe if you would like to make your own adobo sauce. 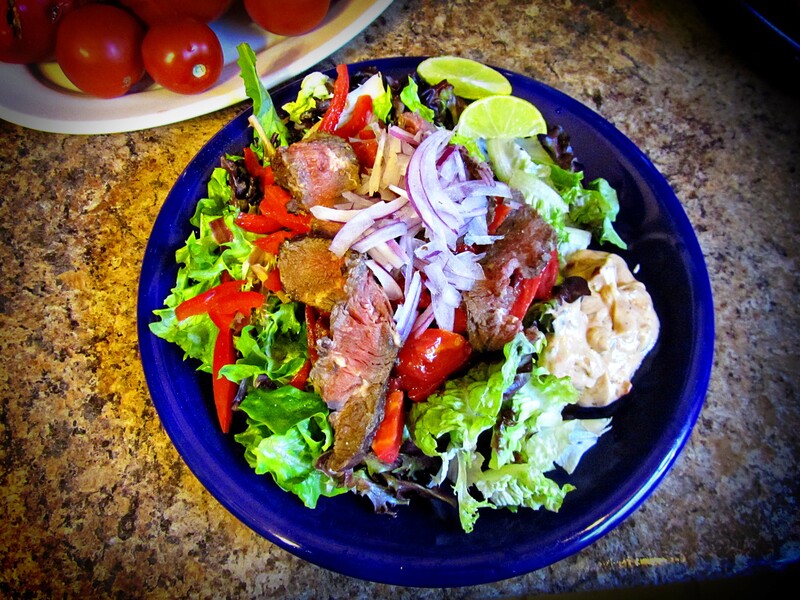 Pile your salad high with greens, red peppers, cucumbers, red onions, tomatoes, and thinly sliced flank steak. Add a big plop of Chipotle Mayo Dressing on the side. 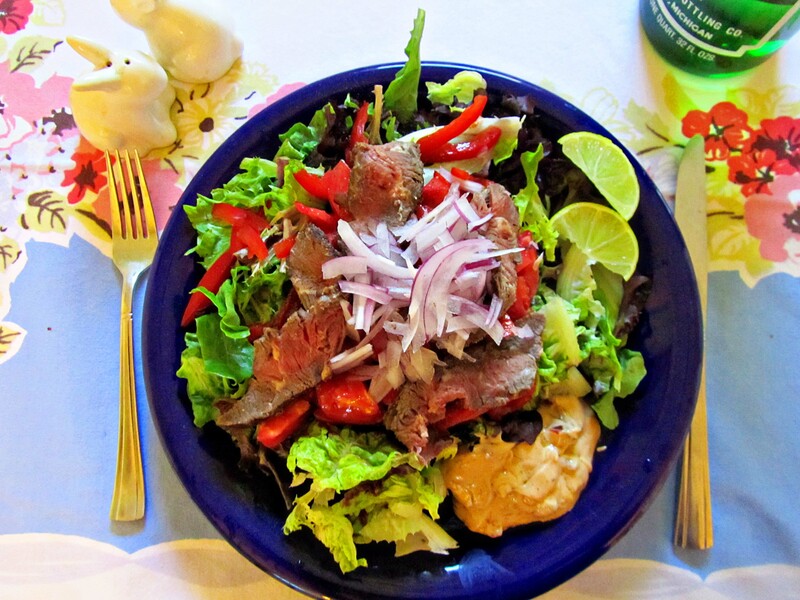 Enjoy your Chipotle Steak Salad. Enjoy you new knowledge of chipotle peppers and adobo sauce. 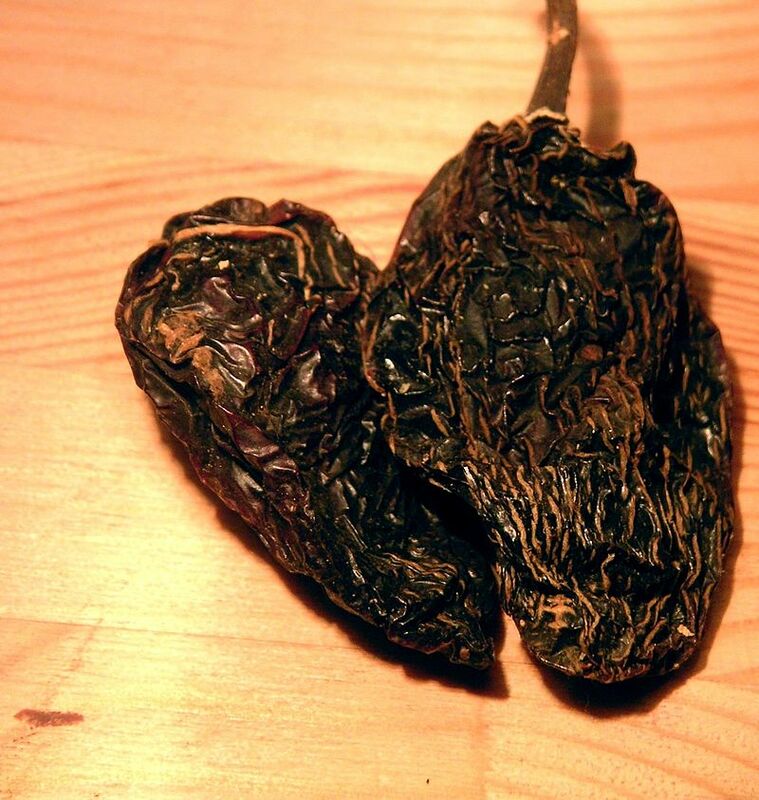 Start thinking about how you are going to incorporate chipotle peppers in your menu. 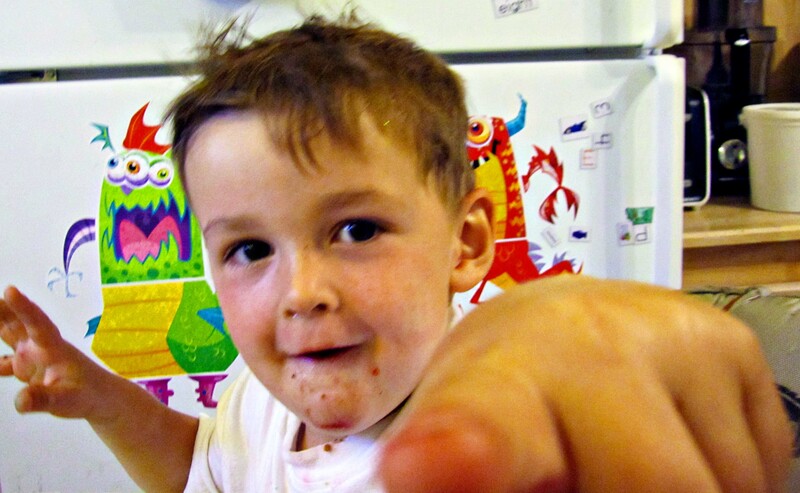 . . .Little Man wants YOU! to leave a comment. TO TELL US HOW HOT YOU LIKE YOUR FOOD. Habanero hot? Middle of the road chipotle? or Banana pepper powerless? This entry was posted in Recipes and tagged Chipotle chiles in adobo sauce, cooking pioneer woman's cookbook, cooking ree drummond's cookbook, how hot is a chipotle pepper, how to pronounce chipotle, scoville rating of peppers, steak salad, what are chipotle peppers, what is adobo sauce. Bookmark the permalink. Ketchup is spicy for me 🙂 With that said–Ree’s chipotle steak salad is one of my favorite foods ever. I use very few peppers, lots of the adobo sauce, and quite a bit of mayo. The kids just use ranch. And Tadd has his with all the extra peppers : ) The first time I made the dressing I tried it at full power and actually was weeping and applying ice to my lips for a long time after. I’m a big fat baby. Can’t wait to try the pizza. Will probably end up using Trader Joe’s dough since I’m also a big fat failure after years of trying my own pizza dough. 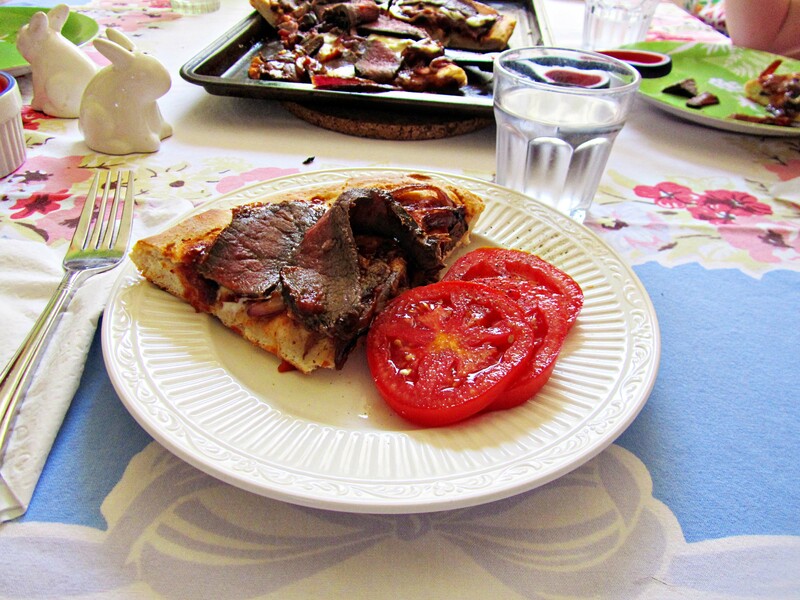 I love Trader Joe’s Pizza dough, and SO cheap! I buy several and freeze them for emergency days. Oh! and Sam’s Club also sells their pizza dough, not in the store, but at the pizza counter. It is less than $1.00 per pizza, but you have to buy the whole box. About 30 cannon ball size dough balls if I remember correctly. I’ve done this before and used the dough for calzones as well. What a beautiful looking salad creation – as beautiful as the beautiful game (as we call soccer over here) – although for us it’s football not soccer – what you call football we call rugby and we just lost the second most important competition – after the rugby world cup – to Wales. Wales you say? What is Wales? It’s a place that is smaller than North Dakota and they beat us at Rugby…. Oh Summer. Will it ever come? I bet that would be tasty with some glockamola. I can’t even say the word correctly now–thanks a lot!